I recently bought a few bits off of the Monki website, and spent over a week (im)patiently waiting for them. I think that I can happily say that it is quickly becoming one of my favourite online shops. The clothes are all amazing; I'd been on the look out for a plain blouse with a pointy collar and Monki had the perfect one, and for half price too! Everything has a feminine feel, from the chiffon dresses, to the thick knit cardigans and jumpers. Plus, being the sister company to H&M, nothing is too out of my price range! I can see myself living in Monki for the rest of winter now! I would really recommend taking a look at their online shop, all of the prices are in Euro's, but they do ship to the UK, and it only takes a little over a week. 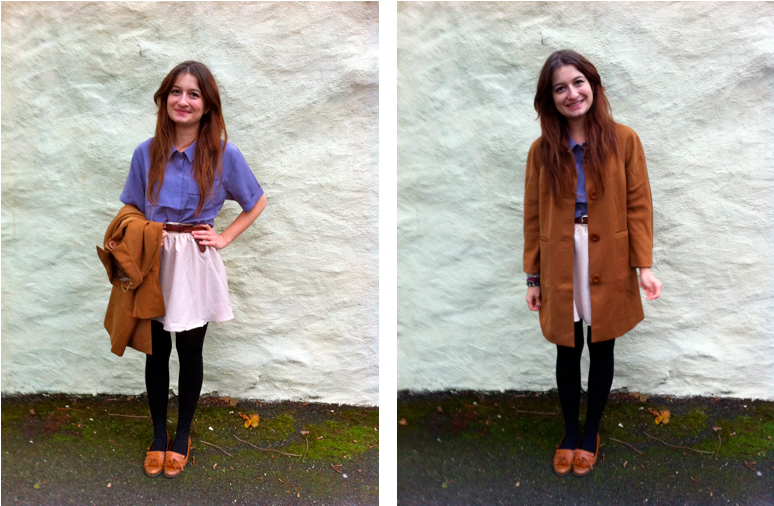 Blouse, Skirt, Coat: Monki Loafers: River Island Belt: Seriously Old! I just have to tell you how much I dislike these pictures, I look like a five year old girl! Plus, I never even noticed the massive crease in my top until looking back at this! Oh well, I just wanted to show some of the things that I bought, so please bear with me, ha! I can't believe Halloween is just around the corner, where has this year gone? Me and all of my housemates bought lots of decorations for our house last night, can't wait to put them all up! We're having a party Monday night, and I'm dressing up as a dead bride, so my mission for today, and this weekend, is to find a really old wedding-y dress! How do you feel about Halloween, I know that it seems to be the holiday that's either loved or hated? What are you dressing up as for Halloween, any ideas? I've never actually hosted a giveaway before, but to celebrate gaining 50 followers (I now have 63! ), and to say a massive thank you to everyone who reads this blog, I've decided to give it a go! It took me a while trying to decide what sort of thing I was going to give as a present, but in the end I chose something that I would love to receive myself! I love jewellery, especially rings, so, as you can guess, that is what the prize is! 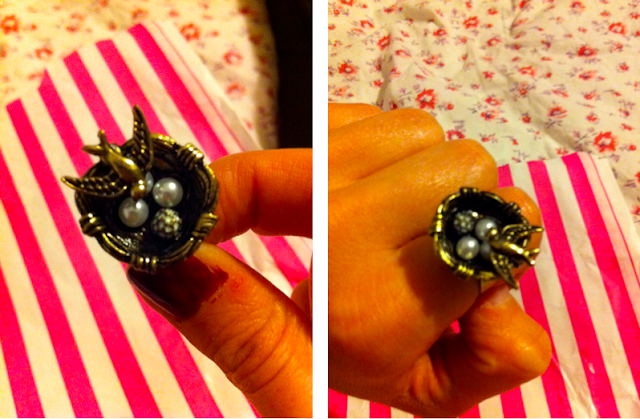 The ring is from a boutique shop in Falmouth, Cornwall, and has a pretty design of a swallow and some beads in a nest. The ring's size is changeable, so it'll fit everybody and anybody's finger! So, for the lucky giveaway winner, you will receive one Swallow ring in an interchangeable size! The giveaway will close at midday on the 2nd of November! Thank you once again, it means so much to me that there are lovely people out there following my rambling essays of (sometimes) nonsense, and so thank you so much to all of my new, and old, followers!! During my first year at University, I never properly ventured out of the campus and local towns. 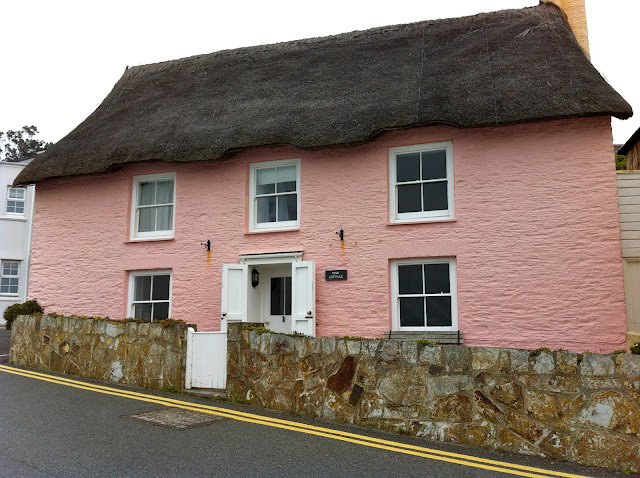 However, I vowed to changed this as I brought my car with me for second year, with the aim to explore my beautiful surroundings that is Cornwall. It would seem like such a shame/waste if I spent 3 years in an area that I never truly knew. So today, me and Alessio decided to venture to St Mawes, a little seaside village just over the Fal Estuary. 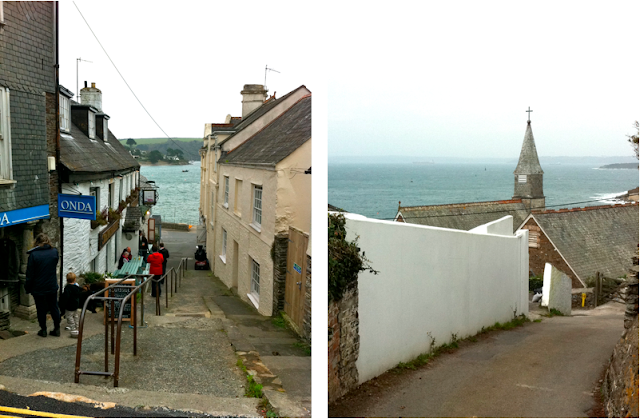 It's such a lovely little town, if a little small, made up of cobbled streets and cute little cottages. The sea was treacherous and I felt like I spent the entire day clinging onto my hair. 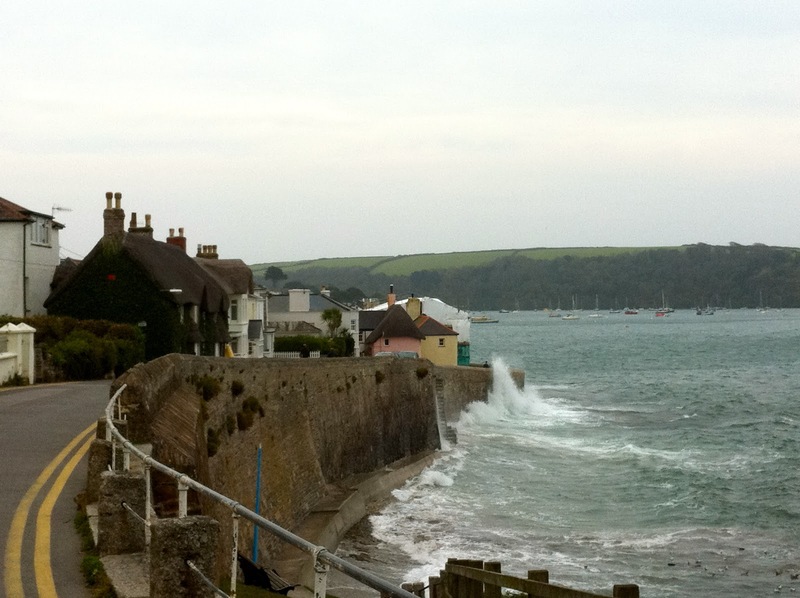 St Mawes hosts one of the best-preserved coastal artillery fortresses built under the reign of Henry VIII, built between 1539 and 1545 to counter any invasion from France and Spain. It's such an amazing building to look at from the outside, but I was quite disappointed with it inside, there was no information inside and the site was left completely empty! When I visit historic sites, I like to be bombarded with information, pictures, and interactive bits to fully learn about the site. Oh well, I had a delicious roast and cream tea which made up for it! I've recently become a bit obsessed with fur, especially fur collars. I saw this one on asos, and loved how big it was, and immediately was thinking about how many of my coats it would just jazz up a little bit. Plus, it was so warm in the crazy wind today! What do you all think about the new 'fur trend'? I've set up a lookbook page for all of my upcoming outfit pictures, which I'm planning to do more often! I was really nervous about having my pictures taken in a public place, but it wasn't too bad as the town was so quiet! Ha! 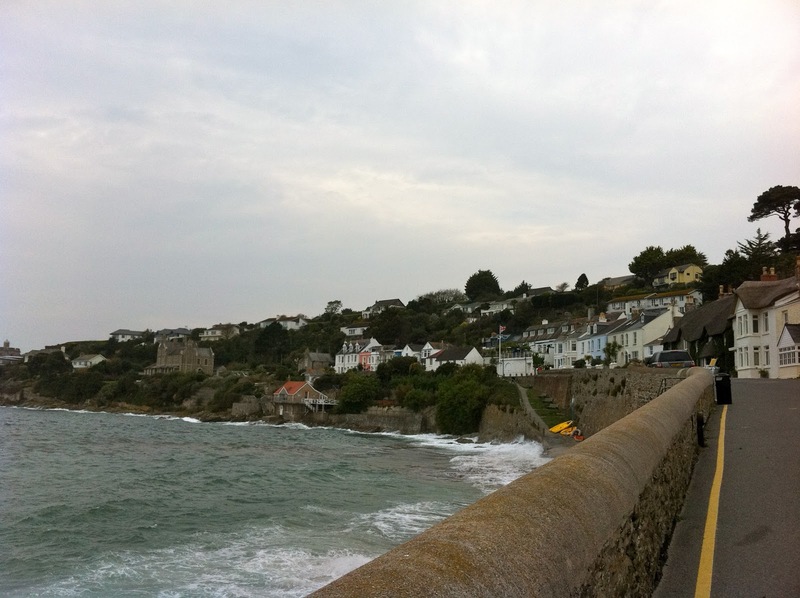 Are there any little seaside towns that you love near you? 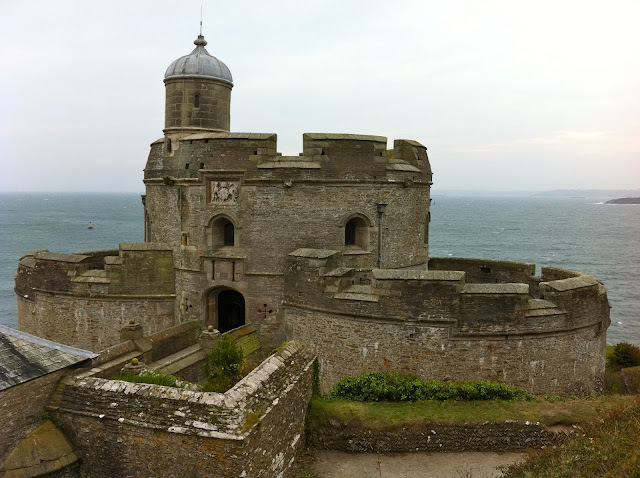 Or any National Trust or English Heritage sites that you can't resist visiting? As a big thank you to all of my amazing new followers, I'm planning on writing a giveaway post, which should be up this week, so feel free to check it out! There are some really good charity shops in my University town, but I never get the chance to properly have a look in them and do them justice. However, I was able to the other day, and was lucky enough to find a couple of items that I just couldn't resist buying! As soon as I saw this, I knew I had to buy it. Polka dots feature quite a lot in my wardrobe, they go with nearly everything and just add a little something to even the plainest of outfits. I love the fit of this shirt, it's a bit too big for me, but with a waist belt or tucked into something high-waisted it's perfect! I love this blouse, I love the colour, the buttons, the collar, the pocket, basically everything about it! It's just a shame it's a tad too big, but I quite like it a bit baggy over a tight dress, or cinched in with a waist belt. Ah, I just love it, I could happily wear this everyday, I'm glad it's starting to get colder now so I can wear it with a chunky knit and have the collar on show! You can't really see in the pictures, but this dress is a lovely dark blue colour. For some reason, whenever I think of autumn and winter clothing, velvet is one of the first things I think of, for wearing at Christmas parties and on Christmas Day. I love the colour and the shape of this dress, but the length swamps me, plus there is a massive split at the back, which ends on my thigh. I'm going to do some playing around with it and shorten it by quite a bit. I can just imagine wearing this as a mini dress, cinched in at the waist with a slight flair, whilst eating a roast back home! Have you found any hidden gems recently in charity shops? After finding these, I'm definitely going to have a look more often! What are you favourite things to wear in the autumn and winter? I bought the Primrose Bakery Book the other day and have since been longing to try out one their lovely recipes. 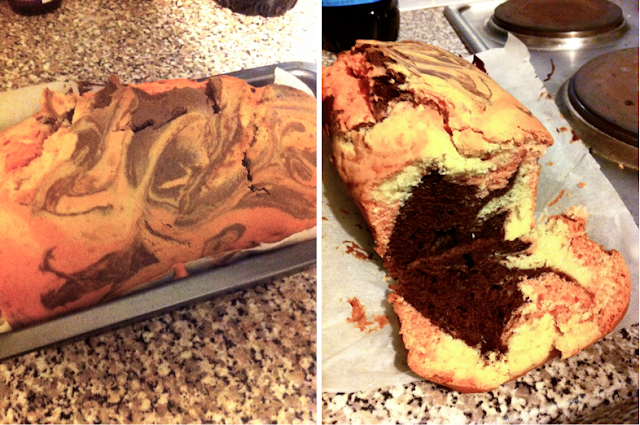 I couldn't resist the marble cake recipe, which also had a hint of pink in it. I've never properly baked before, so I thought I'd start off with something relatively simple, and something that'd go perfectly with a cup of tea! 1. Preheat the oven to 180 degrees / gas mark 4. Grease a loaf tin, or line with baking paper. 2. Cream the butter and sugar together in a large bowl with an electric whisk, until light and fluffy, then add the vanilla extract. Beat the eggs together in a small bowl, and the gradually add to the butter and sugar, mixing well. 4. Divide the mixture between 3 bowls, adding the cocoa powder to one bowl and the red food colouring to another, leaving one bowl untouched. I found that one drop of red food colouring didn't make the shade of red that I wanted, so I just added more until I was happy. Beat the mixtures well. 6. Bake for 50-60 minutes in the middle of the oven. When it is finished, a skewer of knife poked into the middle should come out clean. If not, pop back in the oven for 5 minutes or so. I'm hoping to include more recipes on this blog, as I'm trying to improve my baking skills and become a bit more adventurous and independent with them! Is there anything that you would like to see on here? Or anything recipes that you would recommend? Recipe taken from 'The Primrose Bakery Book', by Martha Swift and Lisa Thomas. The other night, me and Alessio tried out Dolly's Cocktails and Tapas, and you can see what I wore here! Once we'd managed to choose which one to go for out of a list of amazing names, they were served up in teapots and teacups! We went for Flapper's Delight, a mix of vodka, vanilla, lime and apple juice, so delicious and refreshing. I was a bit apprehensive at first, never having had a cocktail before, but i'm so pleased that I did! 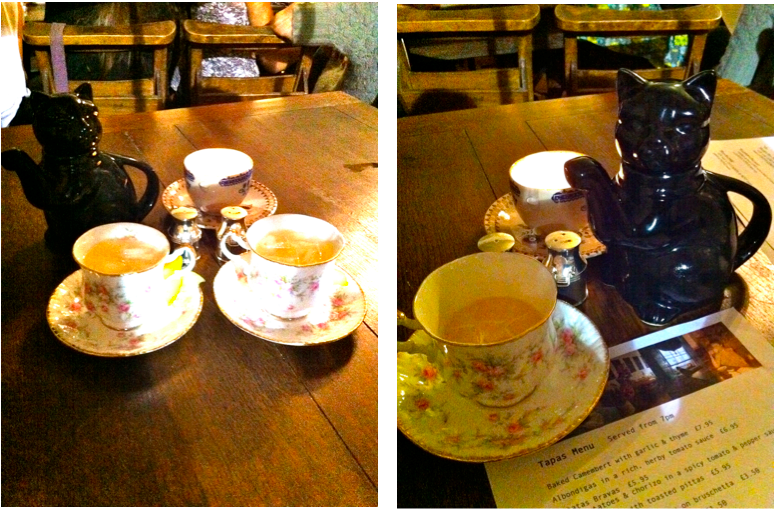 I love the cat teapot that it was served in, and have been searching on ebay since for one! 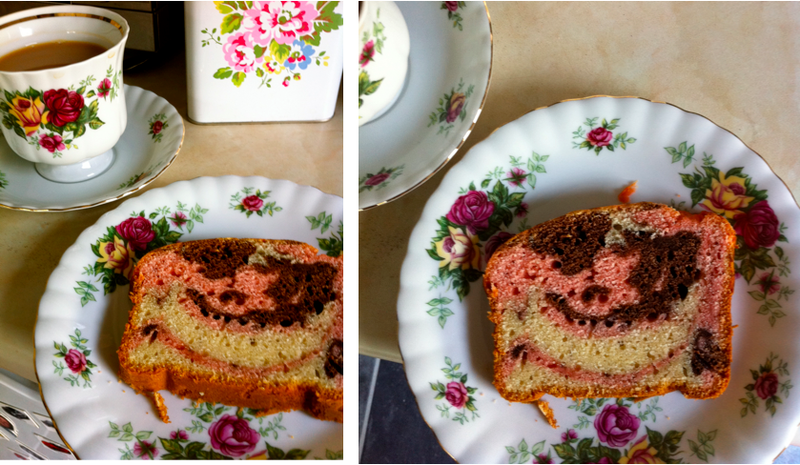 I might give it a go, and try to make some at home, serving them with my new tea set too. Have any of you made your own cocktails before? Are there any you'd recommend, I'd quite like to experiment a bit! 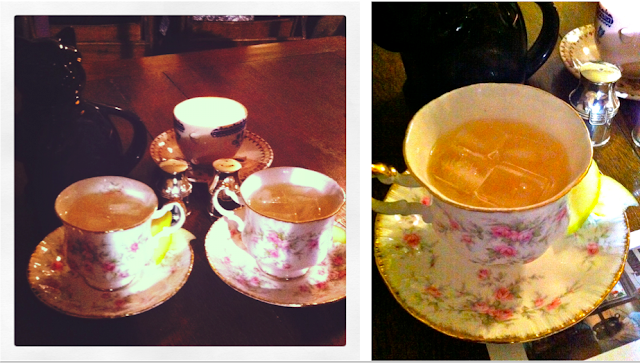 I finished University early today, so me and a friend, Sheri, popped into town for Afternoon Tea. It hasn't been open for very long, and I've never actually eaten in there before, but boy will I be going back! It's beautifully decorated inside, with miss matching tables and chairs, pretty fabric and wallpaper, and teacups and saucers in every nook and cranny. 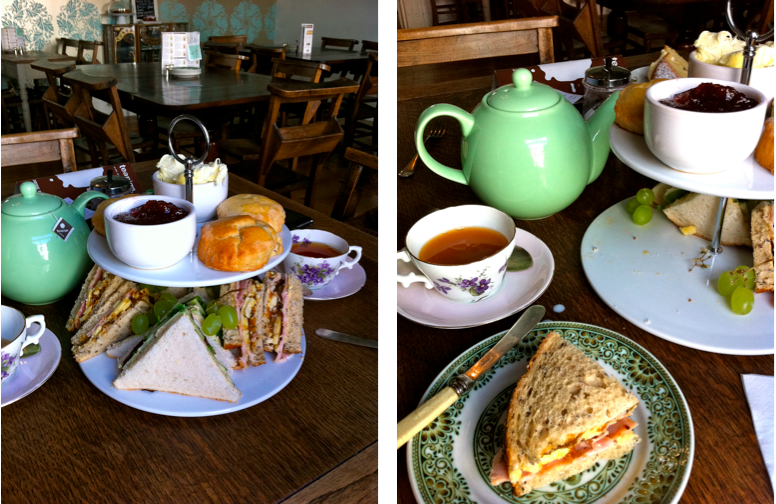 Sheri and I both had the 'High Tea', which consisted of a sandwich, scone with cream and jam, a slice of cake and a cup of tea. Delicious! The food was so lovely, it was just a shame that we couldn't eat it all! 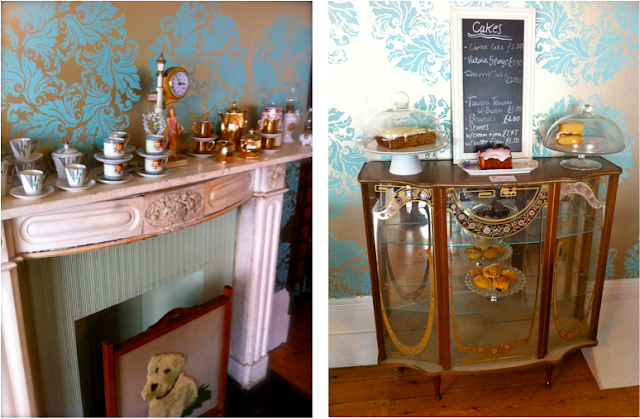 Dolly's Tearoom is such an amazing place. It's pretty hard to find within the town, hidden above the town Bookshop, but it's such a little gem! I can tell that the majority of my spare time (and my loan!) will be spent in this little piece of heaven. In other news, I've been a bit of a bad student and bought quite a few bits and bobs, including the River Island dress that I've been searching for everywhere! 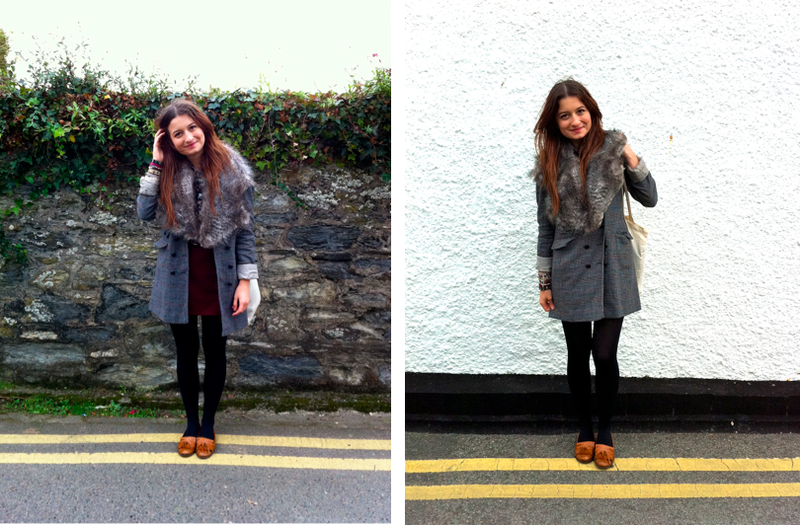 All to come on my next blogpost! I also wanted to say thank you to my latest followers on here, it means so much to me to know that someone out there must like my blog enough to follow it, thank you again! I suppose you could say that I have a little love affair with stationery. Whenever University comes back around, it's probably the thing that I spend the most of my time lusting over, and money on! I have a little bit of an obsession with diaries, for some reason I have about five for this year alone, and I doubt that I'll ever write in them, they're just nice to look at! My favourite stationery company at the moment is O-Check. They're a Korean company that produce the loveliest designs I've ever seen! They all have an old-fashioned feel to them, with French phrases on the front of the diaries, floral patterns, and even stag images. 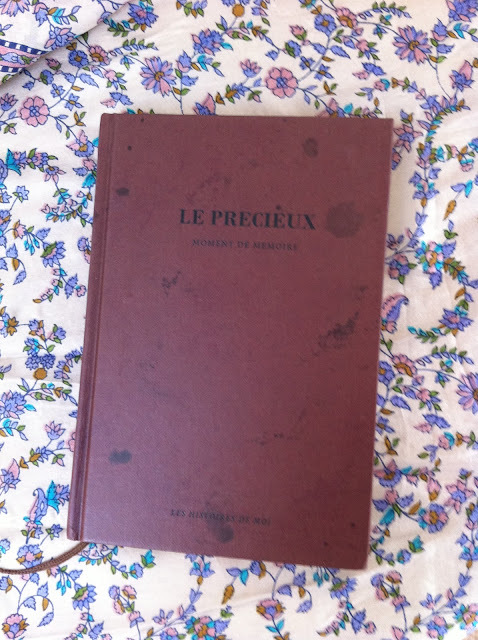 I couldn't resist the brown case, with staining and French phrase on this diary, and quickly snapped it up when I saw it! I've been attempting to write in it so far, I find it hard not writing lists of everything that needs doing. However, i'm left-handed and write quite strangely, (everyone seems to comment on it! ), and really do not want to ruin the pages! I wanted to apologise for my lack of posts recently, it's been over a week! But i've only been back at university for a week, and am still settling in, there's been so many things going on. I've been helping out at various mentor events, history society meetings, and just the other day was the Fresher's Fayre where I held a stall for my High Tea Society. The response was amazing, and over 230 people joined in under two hours! I don't have a clue where we'll find a tearoom big enough! It looks pretty hectic, I know, but hopefully it'll all be sorted soon! I'm also hoping to buy a decent camera soon, so expect proper outfit posts, more Week in Photo's and Historical Outing Posts!